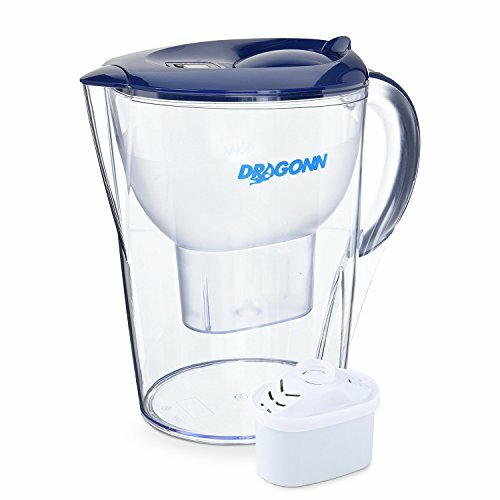 Dragonn’s water filter pitcher will not only remove most of the contaminants in your water, but it will also make it more alkaline and treat it with infrared energy, making it healthier and easier to absorb. This is a highly effective water filter that uses a multi-stage cartridge to remove the contaminants from your water source. The cartridge is composed of ion exchange resins, tourmaline, carbon, and mineral balls. The cartridge is able to remove most of the contaminants in your water, including heavy metals, chlorine, and bad odors and smells. Not only that, but the filter will also remove lead, zinc, copper, and other contaminants, providing a healthy filtered water for 60 days or more, depending on your water source. The filter is made out of premium food grade materials. All the materials used are BPA free, and they are approved by the FDA. Another advantage of using this water filter is that the water molecules are reduced in size through their contact with the ceramics and natural stones in the cartridge. This will make the water easier to assimilate, so you will be more hydrated. The filter has an ergonomic design. You can easily grab its handle and pick it up, and you can store it in your fridge without any problems. This is a very efficient water pitcher filter, and of course, this efficiency can be traced back to the filter cartridges it uses. The filter cartridges are more complex than some of the other manufacturers use, and they produce a clean and good tasting water. The cartridges are designed in multiple layers, so the water will be filtered progressively with each passing layer. The first layer the water reaches is the ion-exchange resin. This is where the water is softened by losing some of the magnesium and calcium compounds it contains. These compounds are attracted to the ion-exchange resins and they stick to their surface releasing the trapped sodium ions in exchange. Once the water passes the ion-exchange filter, it reaches a filter filled with tourmaline. This filter has the role of charging the water negatively with the help of the infrared energy released by the tourmaline. This will make the water even softer, making it easier to absorb into your organism after you drink it. The next filter is filled with mineral balls. These minerals have a double role. First, they will remove some of the contaminants from your water. Some heavy metals, pesticides, copper, and lead are removed from the water at this point. The second role of these balls is to remineralize the water. Some essential minerals like calcium and magnesium will be added to the water, making it richer in nutrients. The last filter the water passes through is the activated carbon filter. This filter has an essential role in the filtration process, as it will remove the rest of the heavy metals, most of the chlorine, as well as bad smells and tastes from the water. After passing through these filter cartridges the water will be softer, thus healthier, cleaner, and it will also taste better. The mineral balls will also reduce the water molecule size, making it easier to absorb. These filter cartridges have a maximum filtration capacity of about 120 gallons, which should last you for about 60 days of continuous use. Before you start using a new cartridge, make sure you remove the shipping sticker on its bottom. The filters might not last very long, but they do an exceptional job at raising your water’s pH, better than most other models. This pitcher has a maximum filtered water capacity of 1 gallon. This is a good capacity, and most people won’t have to refill the pitcher frequently during the day. Both the pitcher and the lid are made out of BPA-free plastic, so they don’t present any health risks. The pitcher has a nice design that will allow you to handle it with ease and fit in any refrigerator currently available on the market. Very Good At Raising The pH – This water pitcher filter is very good at raising the water’s pH. Drinking alkaline water has many benefits, and it will improve your overall health. Large Pitcher – The pitcher has a maximum capacity of 1 gallon, so you won’t have to refill it very often. Filter Gets Clogged – Sometimes the filter gets clogged and you have to rinse it to work faster. Does Not Block Fluoride – Many people across the country drink water containing fluoride. Unfortunately, this model is not capable of removing this compound from the water. Pitcher Could Be Thicker – The pitcher used by this filter is thinner than others. Having a thicker one might increase its durability.